The Pineapple Thief have released a video for their new single Try As I Might. It’s the second track taken from the band’s upcoming album Dissolution, with Bruce Soord and co revealing Far Below back in June. He adds: “I was interested in the concept of ‘in-eye cameras’ – scary technology I am sure isn’t too far away from us. We decided to go down the optical medical route and follow our character on a journey from first pre-operation, to surgery, recovery and then trying to battle the decision he has made, while battling with the corporation he has signed up too. The promo was filmed on the Dorset and Devon coastline, with Laycock revealing they were fortunate to gain access to great locations. The director continues: “To keep the cast down to a minimum, I decided that the camera that’s watching Bruce would become the main supporting actor and his nemesis, appearing in scenes without anyone operating it. This allowed us to see the cameras point of view and tell the story to the fictional viewer. 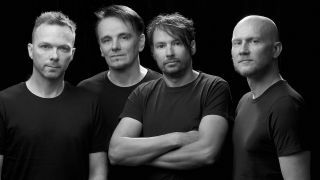 The Pineapple Thief will head out on the Dissolution tour from next month, with dates planned across Europe and the UK.